I've had so much fun photographing Hydrangea's this winter! All the colors, the magical backgrounds, the different kinds and sizes of flowers ... who knew they could be such a delight! The flowers look particularly lovely with a bit of a snow cap. Just enough to frost the ever fragile petals. Now the flowers are starting to fall off the stems and roll around like tumbleweed. Out with the old, in with the new! Kind of like my blog. Lately, as I've been looking around at other blogs, there was one thing that struck me: white, just white. No distracting backgrounds or busy headers. One blog that really caught my eye was Garden by the Sea, and if you haven't stopped by, you really should. Though I usually try to do my own thing when redesigning my template, I love Lupen's simple style so much that I decided to try my own variation of her design. Maybe it's Spring, maybe it's age, I don't know, but lately I feel the need to de-clutter when ever I can. It probably won't last, but for now I hope you enjoy the new look. One thing I do miss is seeing all my favorite blogs on the side bar, but, I hope visitors will still go see them from the Blogs icon. I've always liked the white, too. The photos in your post are incredibly lovely. They always are, actually. Do you trim your hydrangeas and if you do, when? Here, they say not to. I love the header, Sharon! I saw a robin a couple of days ago. Can it be true? Spring? I will be so happy. You know I admire all of your photos. It is a blessing to be able to come to your website and see such gorgeous pictures! Thank you so much. I like the simple style too! Uncluttered suits me as well! By the way your Hydrangeas are very nice! Lovely images! Wish I had taken more photos this winter. I still have a kindergartener at home most of the day, so it's kind of hard, but maybe next year. I love the way you change to please you, variety is the spice of life, and you are keeping it interesting with a critical eye. Your site is always beautiful. I really really like that 2nd capture. Just stunning. So pretty, Sharon! If I keep watching your blog and that beautiful link you shared, I will need to cancel my old, tired blog and start another! I don't think there is ever a season when hydrangeas don't look good. Wonderful photos! As you know, I have changed the look of my blog over and over, yet I keep coming back to white because it's just easier to not be distracted by color. Oh, I like the color on other blogs, but white just keeps this simple and for this old gal's eyes that's a good thing. Your blog is always lovely! Nice clean and fresh look for Spring. Oh I hope we have a Spring this year! 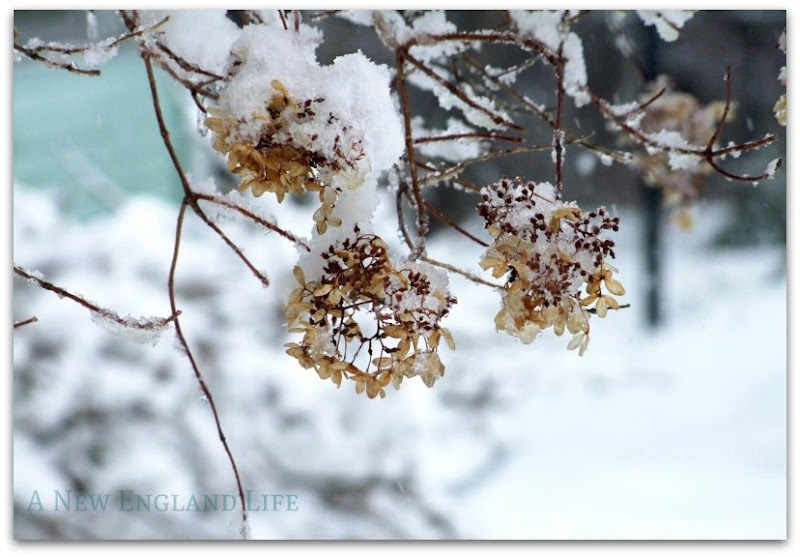 I didn't realize hydrangeas could look so pretty in the Winter! 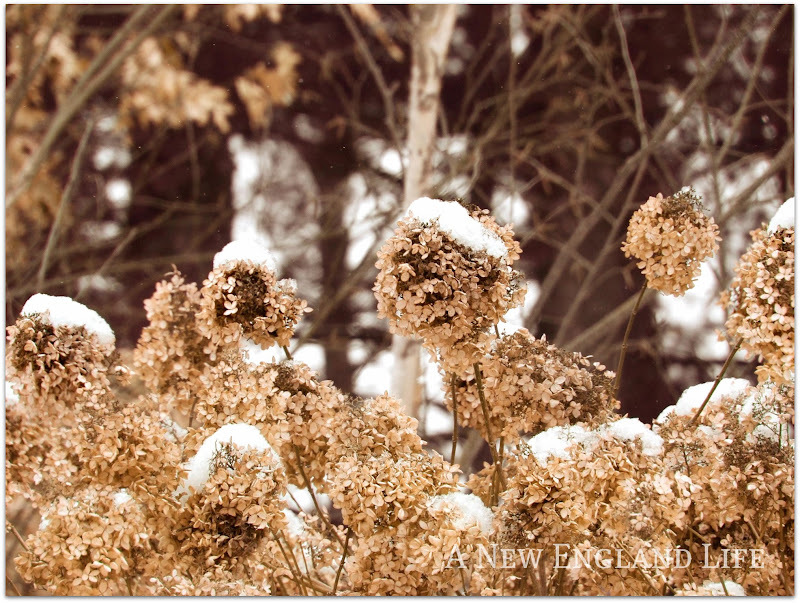 the hydrangea's look so pretty even in the dead of winter. Those hydrangeas look so pretty. We are just getting new shoots on our ones in London. 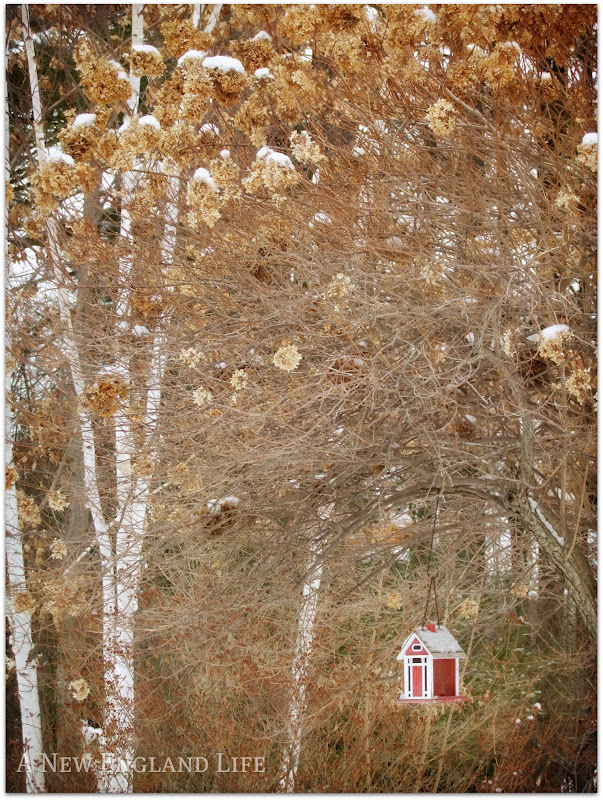 I really like the way the birdhouse stands out in the picture. I like your new look. I went to the all white background some time ago, but I need to work on my sidebar. I love the nead header picture too. Plenty of snow this winter for great photos like yours. My favorite is the last one. Hydrangeas are such fun to photograph! They change all the time and are so beautiful. Gorgeous images and love your new look! This is my first time to your blog, and I just couldn't stop looking at everything, I went back to your older post too, your photos are just amazing, their so beautiful! Stunning . Just stunning. I love your new look here . Im home .Thanks for your very kind words before I left. I sure too them with me and to heart. Oh, just found your blog and like it! I felt the same way about my blog last year - a real urge for clean and uncluttered. I like what you've done here. Checked out Garden by the Sea. Thanks for the tip! I am so glad that I can still comment here. Your blog has been visually stunning and your photography exquisite! You are so gifted! I totally understand your blogging break as I have been feeling the same. You have ended on a triumphant note as your last photo is so beautiful and just this morning I heard the robins singing as I walked...SPRING HAS ARRIVED! Thank you for all the time and effort you have put into your blog....it has been a gift to many, myself included! Thank you Sharon for all the beautiful photos and time you put into this blog, I didn't always comment but please know I am by OFTEN and really loved my visits. God Bless and Happy Spring! A perfect time of year for R&R! Will miss you! I know your comments have been turned off, so I write on another post and hope you dont hate me for it. I too, am a bad blogger. I try so hard to GET comments like the one's you do..but I'm a BAD photographer..no, I mean a bad picture taker..I love, your talent of taking New England photo's..please dont stay away too long, enjoy your peace of mind and then come back to us! I can only imagine what spring photo's you would share with us.. Thank you for all your lovely posts and photos. I'll be sad to see you go, as I especially love glimpsing New England through your images while I'm here in India... but I understand, and wish you all the best! Hope to see you back in the blogosphere again sometime! Ok good I thought I might be the only one commenting on this post but i see many more have done the same. i know the pressures you feel but I hope you know we love your photos and your words. I was just thinking the other day how wonderfully you pare the two together. It's not an easy thing and though you make it look so easy I know it may not be. Enjoy your break but please don't leave us forever. I would just hate that. I may take a blog break myself or just post photos and no words just to show I'm still kicking. I think I can do that....we'll see. Love ya .....enjoy your time away. Will be here when you return. Here's wishing you less stress in your life. I have always enjoyed you blog. I hope someday you can come back to it. 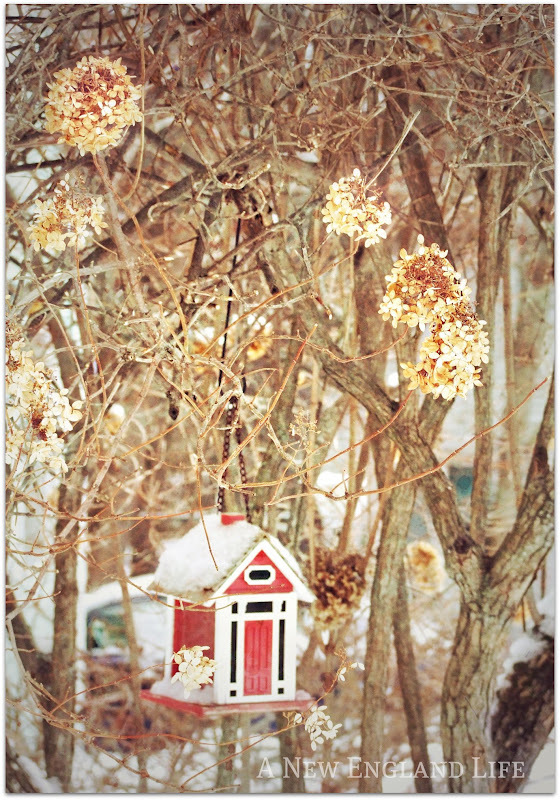 I love that little birdhouse! !